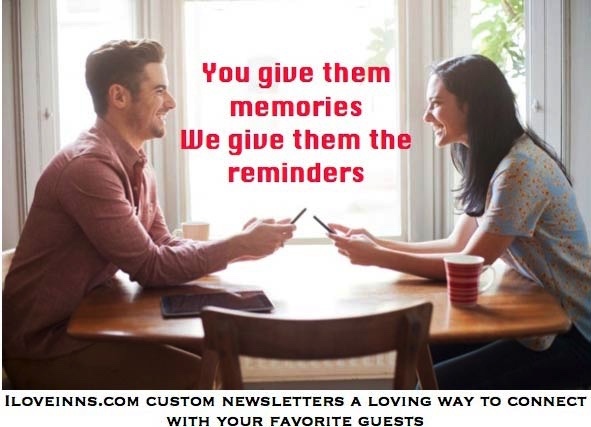 Decide What Your Want – What do you want your guests to do/think/feel when they read your newsletter? Book a room? Write a review? Keep making a plan to return? Write your subject line so that the newsletter will be opened – use recipes, numbered events (3 Top New Chefs) – topics you know your guests are interested in. Find compelling photos to make guests want to return. Size your photos properly to avoid distortion and slow load times. Take your own or find stock photos through your tourism bureau, Folio, iStock etc. 65% of people prefer more images, 35% prefer more text. 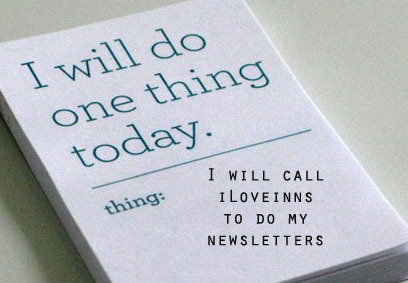 Gather Content – 80% on surrounding activities, 20% about the inn, specials, amenities, recipes, See the iLoveInns Content Idea Starters. Keep a folder on your desk and pop in calendars of local events, festivals, museums, local theater, garden events, sports for the next 3 months. Include food content – the number 1 new trend in travel is food – breakfast or local restaurant dishes, with photos and descriptions to make guests drool. Create links to your website, blog etc. Cut, cut, cut – first drafts are usually too long – make sure no paragraph is too long, usually best to make it short and sweet.